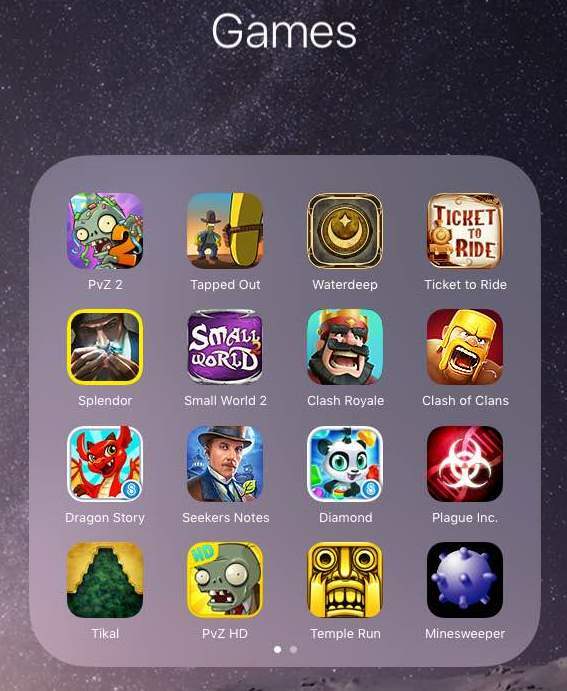 My 12 top games on iPad right now, in no particular order: Plants vs. Zombies 2, Simpsons Tapped Out, Lords of Waterdeep, Ticket to Ride, Splendor, Smallworld, Clash Royale, Clash of Clans, Dragon Story, Seeker’s Notes, Diamond Quest, Tikal, Plants vs. Zombies (original), Temple Run, Minesweeper. Simpsons Tapped Out is probably my longest running game. I know that I’ve been playing for a couple of years at least, because it was back in 2014 that I met a gentleman who I know only as “That guy who I only see once a year at SuperCon and all we ever talk about is Tapped Out.” That guy is fun. I should ask his name next year. 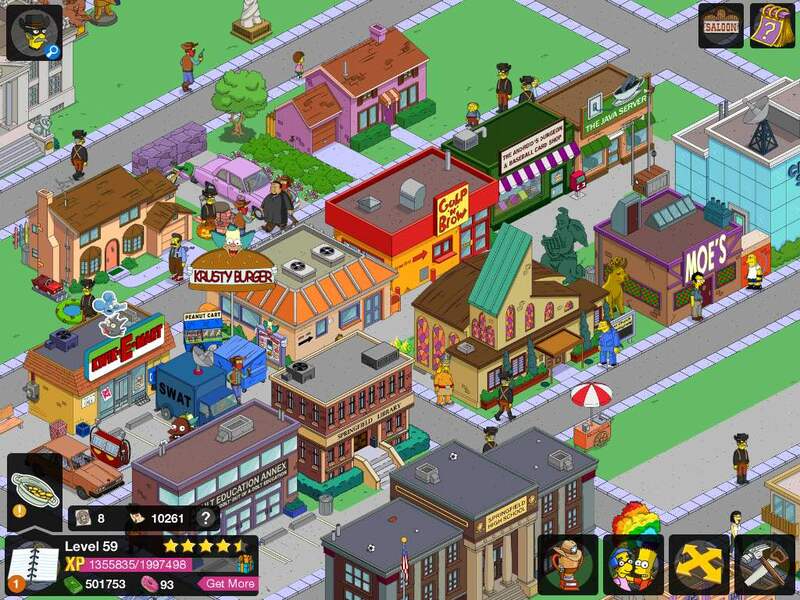 A screenshot of Simpson’s Tapped Out showing some of the iconic buildings from the Simpsons. On a related note, Universal Studio’s Krustyland was eerily familiar after playing this game daily for over a year. My current favorite obsession is Clash Royale, which I only found while looking for Clash of Clans. CoC has been around for a while, and one day about a month ago I decided that I should finally jump on that bandwagon. In the Apple App Store, right next to CoC, was Clash Royale. What caught my eye was the number of reviews that it had. I think I remember that at the time there were about 60,000 reviews and a rating of between 4 and 5 stars. By contrast, CoC had a couple of thousand reviews. Checking back on it now, the App Store is showing over 98,000 reviews and it’s still in the 4.5 star range. Wikipedia says the game was only released earlier this year. There appears to be some complaints about monetization, but I haven’t come across that issue in the early stages of the game. 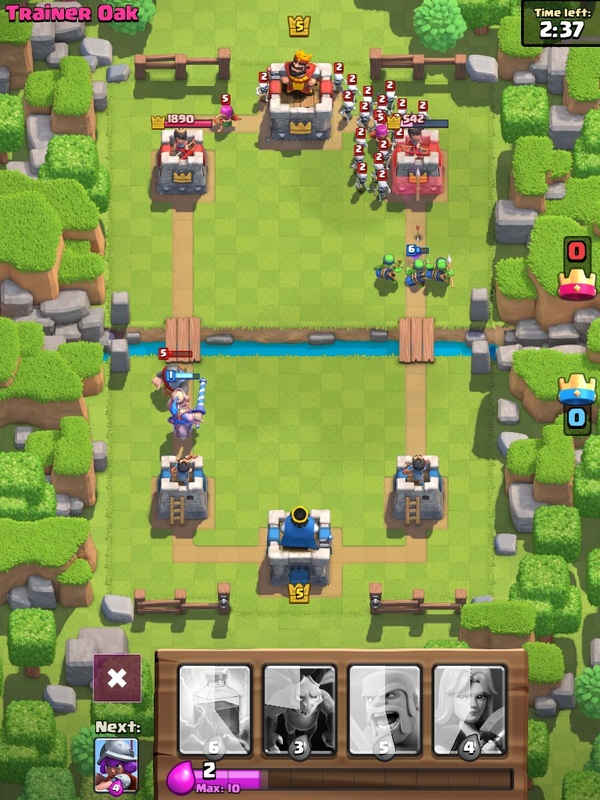 In Clash Royale, you play against a live opponent for three minutes. The goal is to demolish the opponent’s three castles using characters with different strengths and abiities. The characters are earned over time and with experience. You’re only allowed to choose eight characters per battle, but you keep gaining characters, so it’s a bit of a deck builder. When you win a battle you gain trophies. When you loose a battle you lose trophies. The game matches you against opponents with similar a similar amount of trophies, so the battles always feel challenging. I’ve been trying to think on what makes a mobile game interesting for me. Customizable to some degree is good (world-building like Tapped Out, Clash of Clans, Sims, etc.). Some element of nail-biting is good (Clash Royale, Temple Run). Castle defense – thumbs up. I’m a sucker for collection games, but I usually only run one of those at a time. Right now it’s Dragon Story, but for a long time it was Pocket Frog. I managed to avoid most of the Farmville-type games, but I did get dragged into Township by my mom. Board game adaptations are good, although I tend to get spoiled by the computer’s speed, which can make playing with, you know, actual people who need time to think and make decisions feel agonizingly slow. See: games like Ticket to Ride, Splendor and Smallworld. And I love the cheats in the electronic version of Carcasonne, which has an option to display remaining tiles and to highlight available tile placements. What are you playing? What makes mobile gaming fun for you?